Baby Rhino Twinkle at Baby Rhino Rescue | Adopt and Donate Now! Why is Twinkle called Twinkle? What an unusual and fun name for a baby rhino! This is her story: She was found in the Kruger National Park after poachers killed her mother. She arrived at Care for Wild, stressed and terrified, and carrying an old wound on her back that appears to have been inflicted by a machete. There was an attempt to poach Twinkle’s mother. Twinkle was injured, but the mother and Twinkle both survived. She came through the trauma and her wounds healed. Then the poachers struck again, and this time, her mother was killed. Understandably, she arrived at CFW in terrible stress. She was initially reluctant to drink milk because of her acute anxiety and it took some patience, but Twinkle eventually began to drink milk from a bottle. Twinkle was introduced to Don, Warren, Oz and LoFo. Lofo and Twinkle instantly bonded and they are now inseparable. 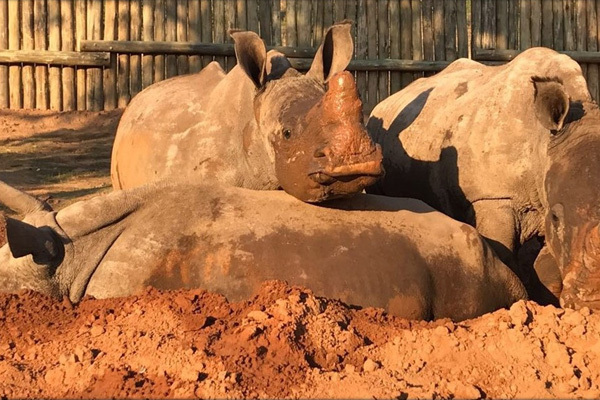 They share sleeping quarters during the night and by day they graze and play with the other rhinos in a large camp filled with various grasses and trees. Another young rhino, Busiso, has joined them, and Twinkle has two very ardent and loyal best friends. She always has a twinkle in her eyes! Therefore her lovely name! It is striking because she survived two poachings, and is still full of light and fun.